I’m getting ready to write my roundup for Tablet of the best Jewy children’s books of the year. So I’m reading tons of reviews and looking at other people’s bests lists and reviewing all the books I’ve gotten this year…and I keep thinking about one particular book that won’t make my list because it is completely not Jewish, but I find my heart leaping each and every time I see the cover. That’s a sure sign of LURV. 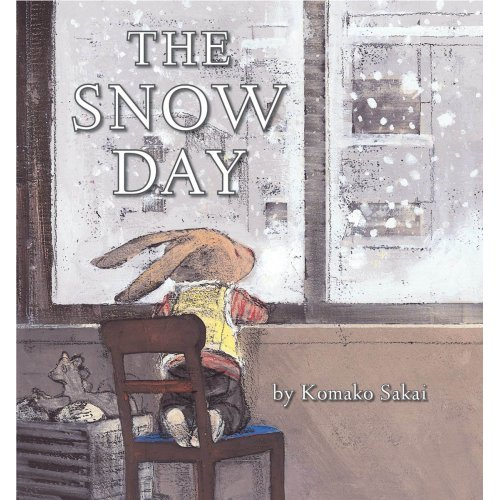 It’s called The Snow Day, by Komako Sakai. It’s such a simple, beautiful book; Maxine (age 5) loves it too — she asks for it over and over and over. The art is just gorgeous — muted colors, adorable but not cutesy bunny, sophisticated and subdued but not kid-offputting look. Looks like a mix of paint and charcoal. The plot’s simple: a little rabbit gets to stay home from kindergarten because of the snow. Her daddy is away on a trip. She’s stuck inside for much of the day, with Mommy. Mommy reports that Daddy is snowed in and can’t fly home as scheduled. Rabbit says, “Mommy, we are all alone in the world.” WHOA. Little rabbits are deep. Given that the rabbits live in a featureless cinderblock apartment (it looks just like Mather House!) with the snow swirling all around and no traffic, I get where the little rabbit is coming from. It all feels sad and mysterious and lovely. Sartre…with BUNNIES! Though I am not a rabbit, I remember that exact feeling of inchoate snowy lonesomeness from my own childhood. Finally, late in the afternoon, little Rabbit gets to play in the snow. I will look for your list at Tablet! Are you on Twitter? (I’m C_Spaghetti there.) I’m catching a lot of great lists on Twitter, but a few do get by me.